Albert Einstein? Narcotics Anonymous? Max Nordau? George Bernard Shaw? George A. Kelly? Rita Mae Brown? John Larroquette? Jessie Potter? Werner Erhard? 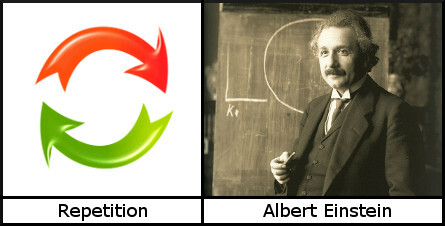 These words are usually credited to the acclaimed genius Albert Einstein. What do you think? The price may seem higher for the addict who prostitutes for a fix than it is for the addict who merely lies to a doctor, but ultimately both pay with their lives. Insanity is repeating the same mistakes and expecting different results. QI acquired a PDF of the document with the quotation above on the website amonymifoundation.org back in February 2011. The document stated that is was printed in November 1981, and it had a 1981 copyright notice. The website was subsequently reorganized, but the document remains available via the Internet Archive Wayback Machine database. Instances of the saying have been employed by other twelve-step organizations such as Alcoholics Anonymous. Rita Mae Brown? Will Rogers? Fred Rose? C. H. White? Simon Bolivar Buckner Jr.? Uncle Zeke? Barry LePatner? Anonymous? 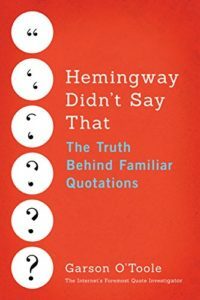 Dear Quote Investigator: Good judgement is rooted in experience, but a humorous addendum notes that the crucible of experience is poor judgment. This notion has been credited to humorist Will Rogers and activist Rita Mae Brown. Would you please explore its origin? The phrasing signaled that the saying was anonymous, and Rose was not asserting coinage. This article presents a snapshot of current knowledge, and earlier citations may be discovered in the future. Rita Mae Brown used the expression in 2001 after it had been circulating for decades. Hillary Clinton? Eleanor Roosevelt? Rita Mae Brown? Phyllis Schlafly? Lowell Bruce Laingen? Armand J. Gariepy? Anonymous? Women are like tea bags. You never know how strong they are until they get into hot water. When did Roosevelt use this expression? Was she the person who coined it? Relieve misfortune quickly. A man is like an egg, the longer he is kept in hot water the harder he is when taken out. Men are like potatoes—they do not know how soon they may be in hot water. Both these expressions have meanings that are distinct from the adage being explored, but they do share similarities and may have facilitated the emergence of variants. QI thanks researcher Barry Popik for notifying him about these precursors. “Their real strength is not drawn out until they get into hot water.”—Times-Picayune. The Boston Transcript says men are like tea—their real strength isn’t drawn out until they get into hot water. Too many salesmen never get into hot water, said Armand J. Gariepy, director of Sales Training International, Barre, Mass. They simply sell by accident, he declared.